The square format of the Saga Edition rule books has been a boon for our gaming group … and our gaming table. Credit: Wizards of the Coast. At which point I looked over at my library game shelf, and thought “amen brother.” And then I had an interesting thought: of all the games I’ve played in the last 3-4 years, the ones I’ve enjoyed most have had a non-standard form factor (non-standard being anything other than the typical 9×11″ form factor we’ve come to associate with D&D). Star Wars: Saga Edition. Savage Worlds Explorers Guide. Spirit of the Century. All of these books share a decidedly different size and layout. They’re all smaller than your average book, which makes them easier to carry in a backpack, read on a plane, etc. But the thing that I’ve found most interesting, particularly over the last year or so that we’ve been playing Savage Worlds and Star Wars, is how it effects the game table. D&D books have a sizable footprint. When everyone has their Player’s Handbooks out, it’s easy to lose 1/3 of the space at your average gaming table; cries of “move your book so I can draw” were common during our D&D days. With Saga Edition (and particularly with the even smaller Savage Worlds Explorers Guide), it’s not like that. The square, 9×9″ Saga Edition books still consume table space, but not as much of it. They’re almost perfectly sized to cover up the edges of the table and perhaps a square or two of the battle map, but that’s it. Even when my friend Nate, who has all of the Saga books, brings his entire collection, the stack makes a tidy pile in one corner of the table. 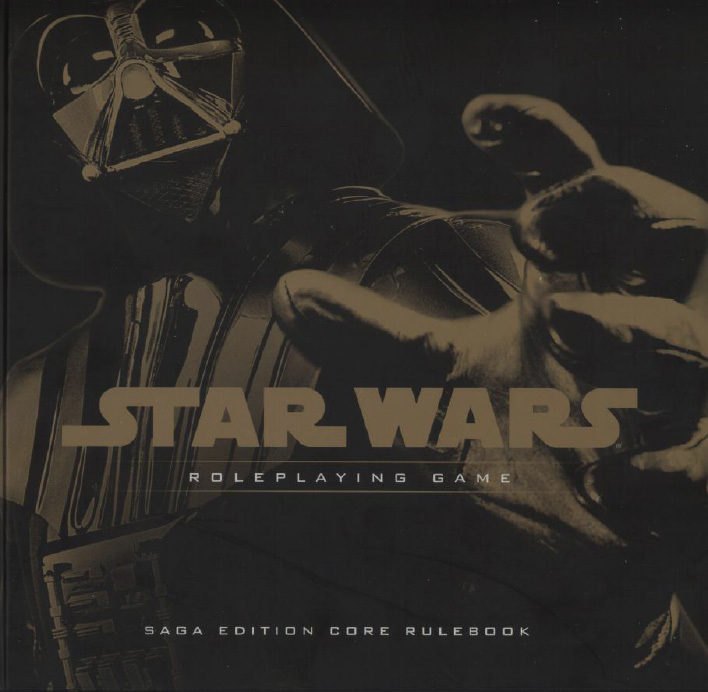 To some extent, it even changes how people reference their books — it may be my imagination, the guys in my Star Wars game seem much more likely to stand and flip through a book, or lean back from the table with the books in their lap, than they were when we were playing D&D. Again, it’s a subtle thing, but I don’t think I’ve had to say “ok, move your books, clear the table” since we’ve started the Star Wars game. The effect was more pronounced with Savage Worlds, because the book is even smaller. The folio edition is perfect for throwing in a kitbag or backpack, and it’s been a staple in mine since I got it at GenCon 2007. The trend follows with other games I’ve been playing (or want to play). Spirit of the Century is actually a hefty little tome, but its easy to carry and reference. My latest purchase, Thousand Suns, is slightly smaller, but again, its paperback format makes it easy to read and transport. Now this isn’t to say I’m not buying books in standard sizes. Over the last two years I’ve also picked up Deadlands Reloaded, Pirates of the Spanish Main, Serenity, and Battlestar Galactica, all of which were normal size, and all of which I enjoyed playing. My D&D 4E books saw heavy use during our playtest, and while we ultimately didn’t end up converting, it wasn’t because of the book’s form factor. It does reveal a bias I only half-realized I had. I’ll keep on buying full-size books, but when I’m wandering the exhibitor’s hall at Origins 2009 this summer, you can bet that I’ll be looking twice at the books that will fit on my library bookshelf.